Thanks to Dr. Vasiliki Tzelepi, University of Patras (Greece), for contributing this case. To contribute a Case of the Week, follow the guidelines on our Case of the Week page. (5) As you may have noticed, we are adding more advertisements, whose revenue pays for website improvements. We will have Amazon ads, Google Ads, drug company ads and other ads, but not popup ads. We are determining the optimum sizes, and have blocked most of the obnoxious ads. If you think others should be blocked, or have any comments, email Dr. Pernick the URL for the offending ad (right click on the ad, then click on Copy Link location, then paste the link into the email) at NatPernick@hotmail.com. (6) Don't forget about using our Books pages to review or purchase Pathology related books. Also, if you are buying ANYTHING from Amazon.com, please click on one of our Amazon.com links before making a purchase, because Amazon will give us a commission from your purchases, at no cost to you, which helps improve our website. 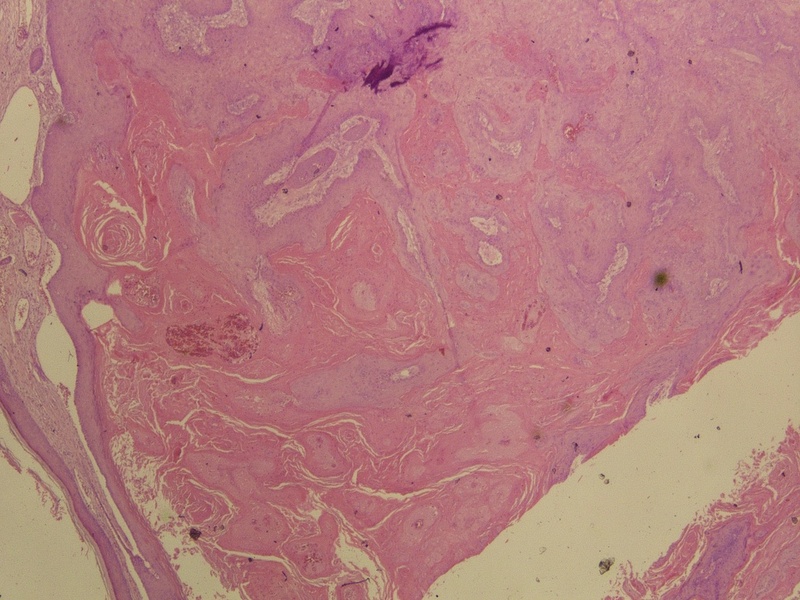 An 87 year old woman presented with a forearm skin lesion, present for about one year without any changes, measuring 2.7 x 1.8 x 0.7 cm. It was excised. Keratoacanthoma (KA) is a hair follicle derived neoplasm occurring in the sun-exposed skin of the elderly, considered by many a well-differentiated form of invasive squamous cell carcinoma, but by others a benign squamous proliferation (Semin Diagn Pathol 2009;26:150). It typically arises from normal skin, grows rapidly for 4-8 weeks, then regresses over 6 months to leave a depressed, annular scar (eMedicine). It only rarely metastasizes. Grossly, keratoacanthoma is a flesh colored, dome shaped lesion with a distinctive central, keratin-filled crater. Its histology varies over time. Early, it is composed of well circumscribed solid lobules of large, pale squamous cells with little keratinization and only mild atypia. In the stable phase, it has a central crater filled with keratin but no granular layer. 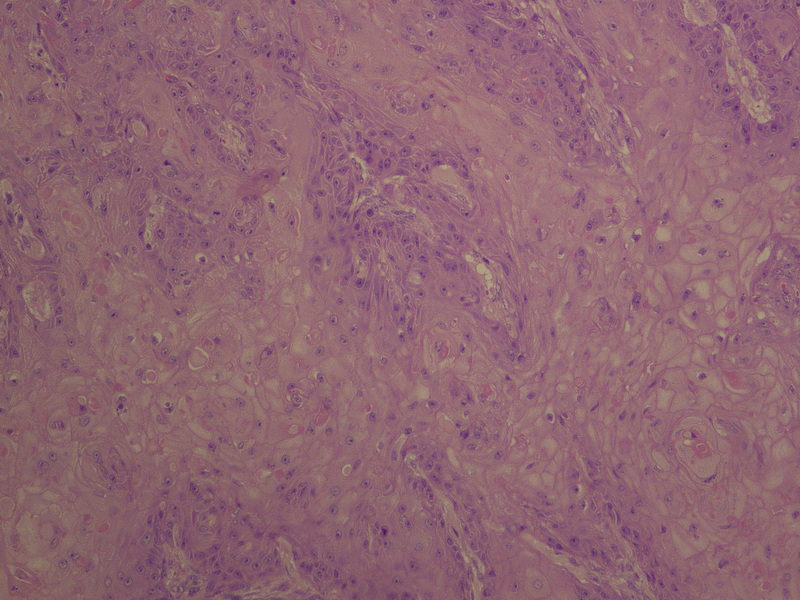 The squamous nests are larger, more irregular and infiltrative, and are accompanied by a marked inflammatory infiltrate with lichenoid features. There may be marked atypia, mitotic figures, atypical mitotic figures at the periphery, perineural invasion (Australas J Dermatol 2001;42:168) and rarely vascular invasion (Dermatol Pract Concept 2012;2:204). In the regressing phase, the keratin filled crater becomes flatter and decreases in diameter. 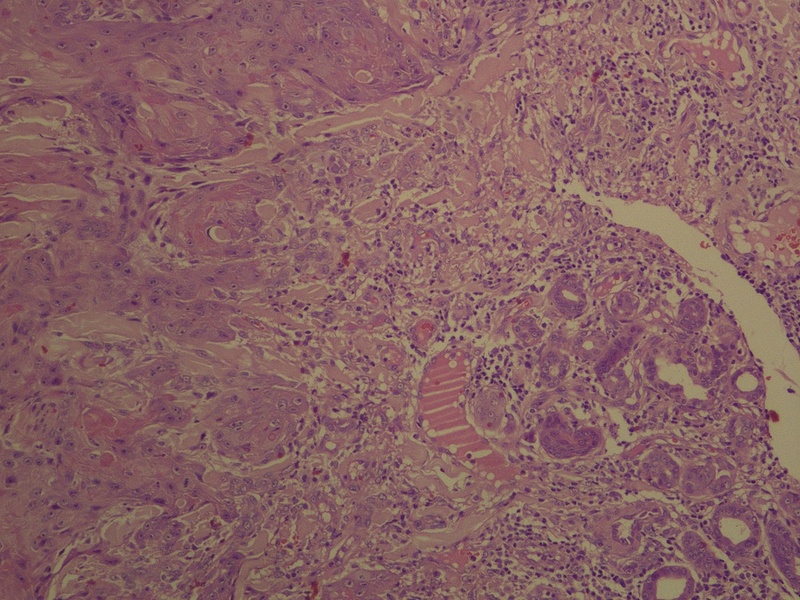 Keratinocytes appear banal and lack glassy pink cytoplasm, and inflammation subsides (J Am Acad Dermatol 2012;67:1008). Classification of keratoacanthoma-like lesions is controversial, and includes classic keratoacanthoma, keratoacantoma-like squamous cell carcinoma, keratoacanthoma with malignant transformation, and other crateriform cutaneous lesions (J Dermatol 2013;40:443). 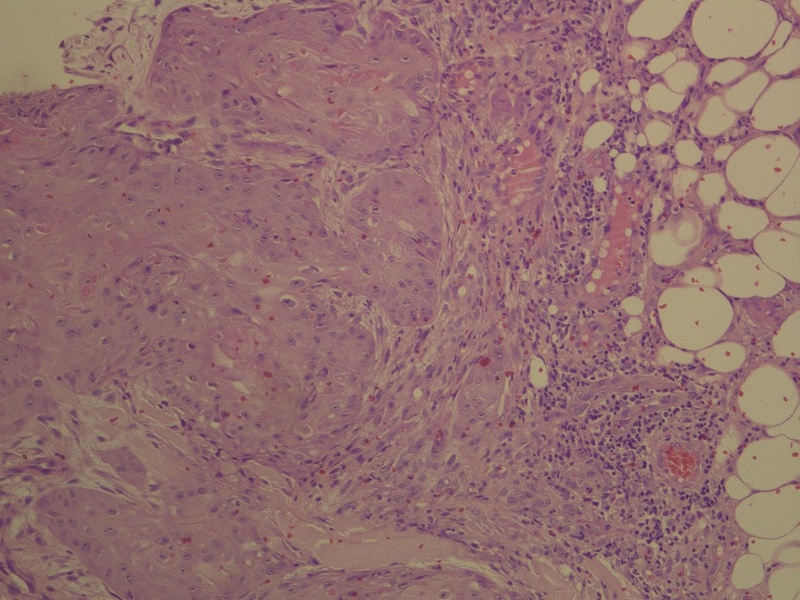 In this case report, the lesion has features of invasive carcinoma including deep infiltration almost to the subcutis, and marked atypia. It lacks classic features of keratoacanthoma, including a keratin-filled crater, overhanging edges and a hemispheric shape. Treatment is primarily surgical, with medical treatment (intralesional methotrexate, Can J Plast Surg 2011;19:e15, steroids, imiquimod, 5-FU) reserved for nonsurgical cases.